I lost my sister in January. She was 33. Those are nine words I never imagined myself writing at this stage in life. They’re the words you write after you’re retired, after you’ve lived a very full life, the words you write in the sunset of your life, not at high noon. I’ve written about my sister, Jenny, before. In fact, it was a post about her that you could say really launched my writing career. That article was about learning to forgive her after years of drug abuse turned her into someone I didn’t recognize, and I refused to acknowledge her very existence. It was published by a popular non-profit, To Write Love on Her Arms, and it solidified my desire to write for a living. On January 25, Jenny — a single mother of three — was the passenger in a van when another vehicle crossed the interstate median and hit her head on, killing her instantly. The driver of the van, who was simply helping her pick up a part to fix her car, as well as the driver of the other vehicle, also died. The driver of the crossing vehicle had cocaine in his system, making an already senseless death all the more senseless. A lot of people have reached out and asked how I’m doing. My response has generally been, “It’s getting better everyday, but the emotions still come in waves.” I need to admit something: That’s not really true. The truth is I don’t really know how I’m doing. I don’t really know how to describe it. If you’re one of those people and you’re reading this, please don’t be offended. I’m really just trying to save you from a lengthy conversation about things deeper than even I’m really comfortable discussing at this point. The fact that you’re reaching out at all means a lot. Truly. And while it’s hard to put into words exactly everything that’s gone through my head over the last three months, there is something I want to share that is very clear: I have not blamed, and I do not blame, God for this tragedy. That’s not to say it hasn’t been hard. Oh friends it’s been hard. Like when you look across the table at a 3-year-old as the family tells her Mommy is never coming home and is up in Heaven with Jesus. Like when you tell your other sister on the night of the tragedy that her baby sister is gone, and then realize she put you on a three-way call with your parents unbeknownst to you. And then you hear your mom whaling in the most raw, guttural, primal way in the background as she finds out. It’s a sound I will never, ever forget. Like when you watch your oldest brother, a grown 40-year-old man, sobbing and unable to bring himself to even stand during the funeral visitation because he is so heartbroken. Like when you see the van she died in, and it’s so mangled it’s hard to make out the outline of the vehicle. Like when the police give you her phone in a plastic baggy and you read the absolutely evil and disgusting things her abusive boyfriend sent her. The van my sister took her last breath in, after someone crossed the center line and hit her head on. 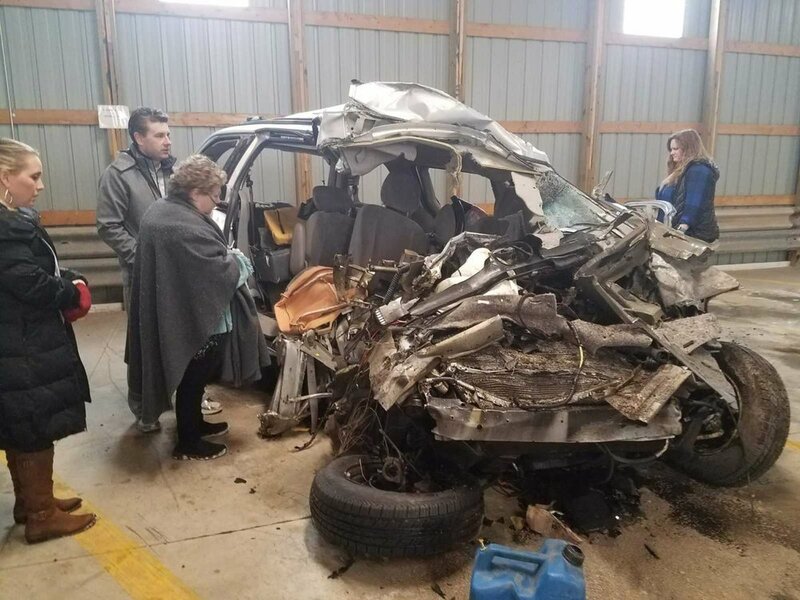 My mom, brother, and sister-in-law take their first look at the vehicle after the accident. But despite the hardship, there’s been a certain comfort that’s stuck around. A peace I can’t fully describe. We know that Jenny affirmed her belief in Jesus just weeks prior to her tragic death, and I think that’s a big part of it. That doesn’t mean I have all the theological points figured out yet. I’ve talked to pastors, seminarians, and friends who have studied these things at length. Jenny was in an abusive relationship that she couldn’t bring herself to leave and she was once again struggling with addiction. Did God “cause” this to break her free from a life she couldn’t make better on her own? There have been times I’ve thought that, but then remember that there were two other lives lost in this tragedy, and it seems so cruel to think that they had to be sacrificed in order to free my sister. Or maybe God didn’t cause this at all. I do believe He could have prevented it, but for some reason He didn’t intervene. And maybe he did that knowing that He would use this tragedy for his glory and to draw more people to Himself. And that’s where I land: He could have prevented it, but for some reason He didn’t. In the end, I still believe God is loving. I still believe that even though tragedies happen, He is still working everything for His glory and our good. I believe in Him because my soul cannot deny it. And I start there as a basis for everything else. So I guess my charge to you is this: God is working in your tragedy. He is there. He is alive. He’s not the cause of your pain, he’s the answer to it. If this post doesn’t convince you, just read Caitlin Jordan’s post about her recent miscarriage. Friends, our God is mighty. Believe me. And that’s coming from someone who lost his 33-year-old sister three months ago. I don't need two kidneys, right?